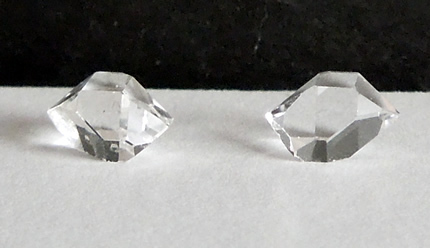 6.5x5x3.75 mm / .64 ct.
6.5x5.5x3.5 mm / .63 ct. Both of these small natural crystals have a brilliant hue, perfect for small earrings or accent crystals. Less than 5% of Herkimer's mined are AA grade quality, and even less of these are floater crystals. 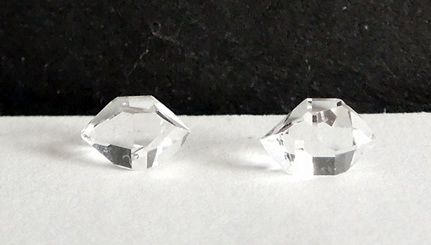 The average size of a flawless AA grade Herkimer Diamond is 6-8 mm. 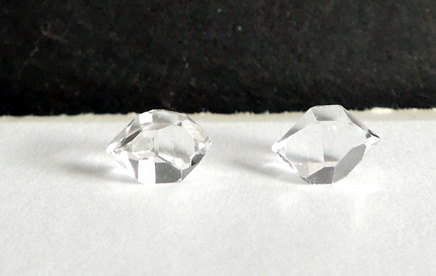 Finding a matching set of Herkimer Diamond floater crystals is more difficult than one would think.